Heat oil in a large heavy bottomed pan over a medium heat add bacon, garlic and mushrooms and let them cook until bacon is cooked (does’t need to be crispy, this is just providing you with a smoky flavour base). Add ginger (fresh and dried), carob powder & spices – stir to allow them to release their oils. Add balsamic vinegar and cook flavours together for 1-2 minutes. Add chopped radishes & carrots and broth, bring to a boil and simmer until veggies are tender. Heat 1 T olive oil in a large skillet over medium heat, add 1 pound beef and allow it to cook until almost cooked through. Add finely chopped onions and continue cooking until meat is cooked and onion is brown. Add the beef and onions to the sauce base. Add chopped carrots, mushrooms and sweet potatoes, bring to a boil and allow to simmer over low heat until veggies are cooked through (25-30 minutes). Add fresh herbs and stir in allow to simmer 5-10 minutes more. Summary: What a huge disappointment! This didn’t remotely taste like chili at all! At best, it was a vegetable stew! We did eat it, but the flavour wasn’t even good enough that we would serve this to anyone. Our search for an AIP chili recipe continues. If you’ve made one that REALLY tasted like chili, please send us the link through the Contact Us on this site so we can test it in our kitchen! There are somethings that just aren’t the same without ketchup… french fries, hamburgers, even eggs if you can have them! Any recipe author/food blogger who claims their recipes will go undetected by non-AIP/Paleo guests is daring us to test their recipes. We tested this ketchup recipe and can’t wait to share how it turned out! Bring water to boil in medium sauce pan. Add beets, carrots and onion. Boil for 10-15 minutes, until tender. While vegetables are boiling, add remaining ingredients to blender. Strain and add vegetables to blender when they are through cooking. Carefully blend on high until liquefied. Return blended mixture to sauce pan and bring to a boil. Reduce heat to low and simmer for 30 minutes. SUMMARY: This ketchup blew us away, it was so good!!! We initially served it to family and friends it passed as the real thing, and when we told them it was homemade and didn’t contain tomatoes they couldn’t believe it! It simply is that good! So, if you’ve been missing ketchup, you’ve gotta make this! You can order your copy of The Paleo Approach cookbook here. We love this recipe made with orange sweet potatoes. We have served it to family and friends who not only rave about how good they taste with a little ghee, but also help themselves to seconds and thirds! Ruth has discovered that you can roll the dough into a log shape and then cut the biscuits to a uniform thickness easily with a knife. Quick and easy! 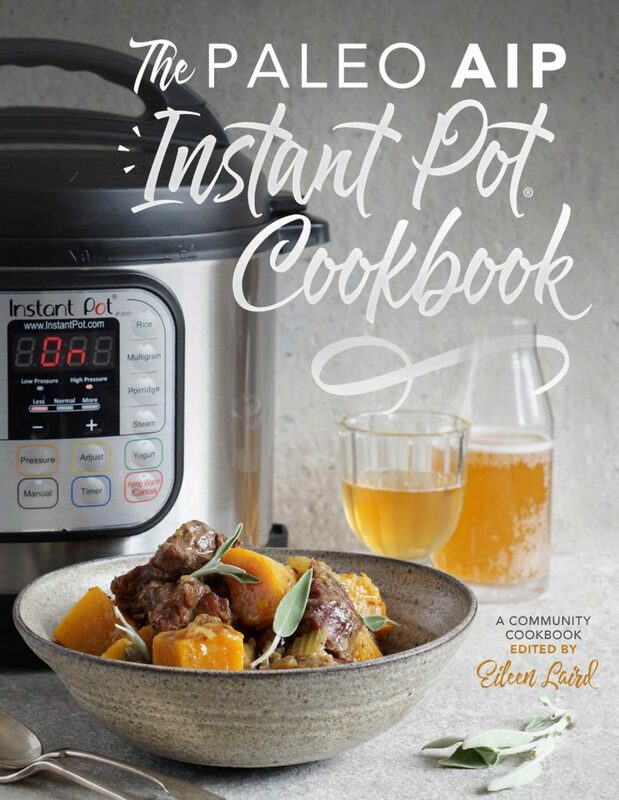 You can order your copy of The PALEO AIP Instant Pot Cookbook here. Summary: We have made this recipe more than once and served it to family who enjoyed it too! We would definitely recommend using an immersion blender to thicken the sauce and let it reduce well for best results. Preheat oven to 425° F for large tarts or 350° F for mini tarts. Place dates in warm water. Cut shortening into flour until crumbly. Set aside. Pour dates and water into blender, add coconut oil, maple syrup and vanilla. Purée until smooth. Pour purée into bowl. Quickly whisk in tapioca, making sure there are no lumps. Mix in raisins. Set aside. Add mineral water to flour mixture. Mix until combined and forms a dough! Separate dough into 4 muffin cups or 12 mini muffin cups. Using fingers press and form the dough into a tart shell inside the muffin cups. For large tarts: bake at 425 for 25 minutes. For mini tarts: bake at 350 for 30 minutes. SUMMARY: Although these butter tarts do not have the syrupy, oozing filling of the fav tarts of my past, the pastry has nice texture and they certainly taste like butter tarts! Chris could not stop at just one and our family enjoyed them too. If you’re missing butter tarts, you should try this one! Place chicken wings in a large bowl (if overly wet, pat dry with paper towel). Heat coconut oil over medium-high heat in a small saucepan. Add ginger, garlic, anise and fennel seed and cook, stirring so that it doesn’t burn, until fragrant, about 2-3 minutes. Add coconut aminos, honey, vinegar, and fish sauce. Bring to a boil and simmer for 1 minute. Remove from heat and add sesame oil. Drain excess marinade off wings. Barbecue wings until cooked, turning once (something like 20 minutes total depending on how hot your grill is). Alternatively, you could place the wings on a baking sheet lined with tinfoil (might want to grease first) and bake at 375F for 45 minutes to 1 hour, until fully cooked (internal temperature should reach 180F). Summary: Chris LOVES to make these wings and the rest of our family LOVES to eat them! We’ve made them for friends who rave about them too! We watch for meaty wings at our local farm store to make these extra yummy! They even reheat well….if you hide a few, or double the recipe, so there are some leftover! LOL! When we decided to make this dish for breakfast, Chris just wasn’t too sure about this bowl. The flavour combinations didn’t jump out and say “YES I will taste yummy” to him. Well since we started on this journey, thankfully we both have always tried to keep an open mind …..
Summary: When we posted this on our personal FB pages, one of our friends begged to be invited to breakfast. It does look good, doesn’t it? It tastes even better, and pairs nicely with avocado and the Cauliflower Rice recipe we tested earlier! We’re betting you could switch out the green vegetable for broccoli or kale too! Peel the plantains and chop them each into 4 pieces. Place the plantain pieces in a high speed blender and blend until smooth (or as smooth as possible until it becomes too difficult to blend more). Add the oil to the plantains and blend again, now until completely pureed. Add the cinnamon, vanilla and apple cider vinegar to the blender. Blend again on high for a few seconds to mix well. Add the salt and baking soda to the blender. You can blend again to mix or use a spatula to stir the ingredients into the batter by hand. Oil your waffle iron and place ⅓ cup of batter into the centre of your waffle iron. The amount of batter you use may vary depending on your waffle maker and it’s instructions. I have used a Belgian and classic waffle maker. Both work, but I prefer the classic. Cook until the waffle is browned to your liking, and repeat until the batter is gone. Be sure to keep the waffle maker oiled before each waffle. Transfer the cooked waffles to a wire cooling rack rather than stacking them on a plate as you cook. Serve with maple syrup, fresh fruit and whipped coconut cream! Notes (from the recipe author): These waffles work best when your plantains are varied in ripeness. If one of your plantains are more ripe (yellow with black spots) and one is medium ripe (mostly green) they always turn out best. The ripe plantain will contribute the sweet flavour, while the less ripe will add more starch to help them hold. Summary: It’s important to pay attention to the notes from the recipe author on this one. Also, sometimes the colour can be a little weird after baking, even though the taste isn’t affected, and they have a stronger banana flavour if you use riper plantains. We like them well enough that we have made them several times, but for these reasons we’re not sure how well our non-AIP/Paleo friends and family would like them. We find that when we use our Cuisinart CGR-4NC 5-in-1 Griddler with the Cuisinart Griddler Waffle Plates they turn out just right when we bake them for 6-7 minutes! Worth a try if you like other plantain recipes.